Making a book is basically what a bookmaker does. They offer a set of bets on the outcome of an event. A simple book would be a tennis match where either Andy Murray will win, or Novak Djokovic will win (more likely!). The more possible outcomes for an event, such as as football tournament or horse race, the more complicated the process of making the book becomes, but the principals are the same. The goal for the bookmaker is to make a "green book", this is one where they will make a profit (known as a vig or over round) regardless of the outcome. 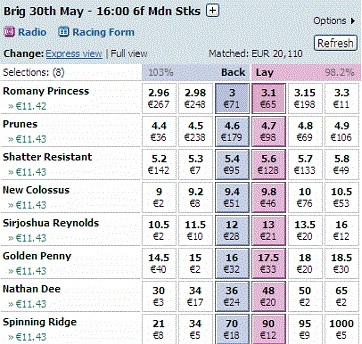 Given that a betting exchange allows you to be the bookmaker, you can also create your own book and green up on events. If you're not interested in the long winded definition, then The Gambling Times dictionary has a decent summary of making a book, and links to some further reading on the subject. Key to profiting from making your own book, and how you use it in contrast to dutching, is that making a book doesn't mean you have to offer odds on every single eventuality. Placing bets on boosts and offers at bookmakers on specific participants or teams, using IF Bets and watching for price movements can get you greened up and guaranteed a profit regardless of the outcome. Of course these techniques can be used for individual matches and sporting one offs, but it comes into it's own as a way of making best use of (read taking advantage of!) outright market offers and promotions being offered by different bookmakers at large events like the World Cup. As an example Bet365 might offer a refund if England win the World Cup, BetFred might offer a refund on Brazil winning the World Cup, Coral might offer a refund if Germany win the World Cup. In this situation you place a bet at Bet365 on any team other than England where you can get a good match on the back and lay. If England win the World Cup then you get a refund on your bet at Bet365 and have also won your lay at the exchange, profit. You do the same across all the bookmakers on all the boosts and you have increased your chances of profiting without risking your funds, which is the very essence of advantage play betting. Add to that the ability to continue to trade at BetFair whilst the event is happening and you're in a very good situation compared to the mug punters who might take the offers in isolation. On top of the obvious profit, making a book can also help with liability sharing, which is incredibly useful if you don't want to tie up a large proportion of your exchange balance on one selection. When you place a lay bet you are committing that part of your balance to the market and it can't be used on any other market, however, you can place further lay bets on the same market provided the second lay is less than or equal to the initial lay, as only a maximum of one of those lays could come in for the punter that took them. Also worth a nod with regards to making a book is the ability to get arbs more easily from long term markets. An arb for something happening today will be taken quickly, but one which might not come good for a month or more? It'll stick around longer as people don't want to commit their floats to them. Of course if you're making a book and already have a liability on that market taking the arbs doesn't really cost you anything in terms of tying up anymore float. And finally the boosts on popular teams and picks will create arbs and possibly sharbs as well. So whilst for smaller events you might want to do standard IF Bets, when it comes to the big tournaments you really should be making a book and greening up your BetFair account. To help you along the way, you should get a daily list of If Bets and join a forum to share information.